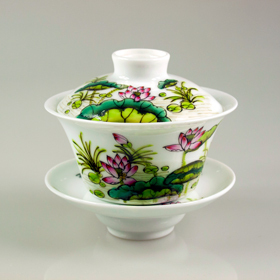 Hand Painted Gaiwan comes in 3 different designs; lotus flower, yulan flower and tea flower. Hand Painted Gaiwan is made from delicate porcelain in Jing De Zhen. Each tea cup exhibits very high level of craftmanship in the porcelain making, which is of very good quality, but also in the painting.